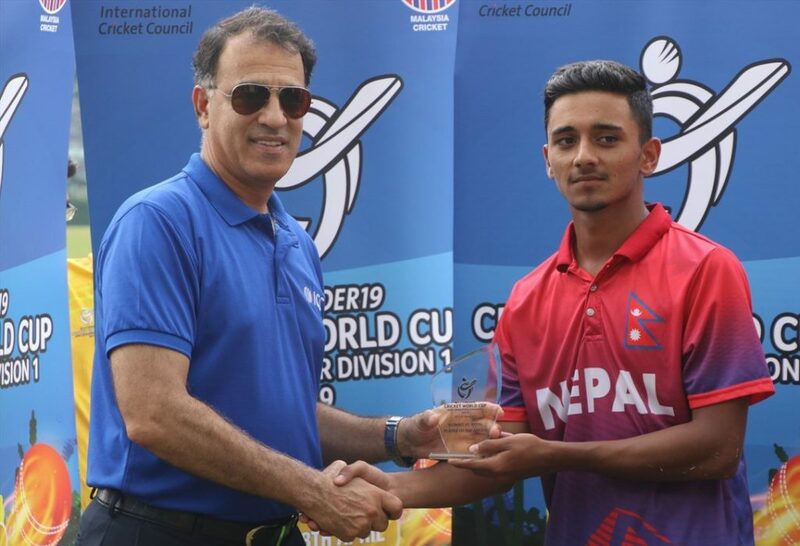 Home > News > ICC U19 Cricket World Cup Qualifier Asia 2019: Nepal Fails to Qualify! 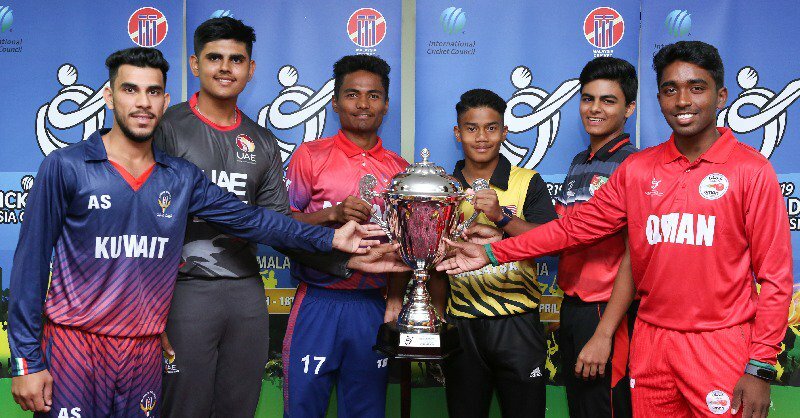 Despite four wins against Malaysia, Oman, Singapore and Kuwait, Nepal failed to see the expected success in the ICC U19 Qualifier tournament. The team lost the chance to enter the ICC World Cup Cricket 2020 after its failure in a match against UAE on April 13, 2019. UAE won all the five matches and will now move to the main ICC U19 World Cup event! 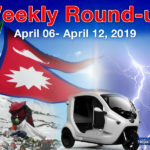 Match 5 of the tournament saw an intense fight between Nepal and Kuwait teams. The match began with Nepalis winning the toss and choosing to field first. Kuwait team stepped in to bat and made a slow start. Driven by Noman Budroo’s 70-run score and single-digit scores by many others, the team managed to score 157 runs in 49.4 overs for the loss of all wickets. 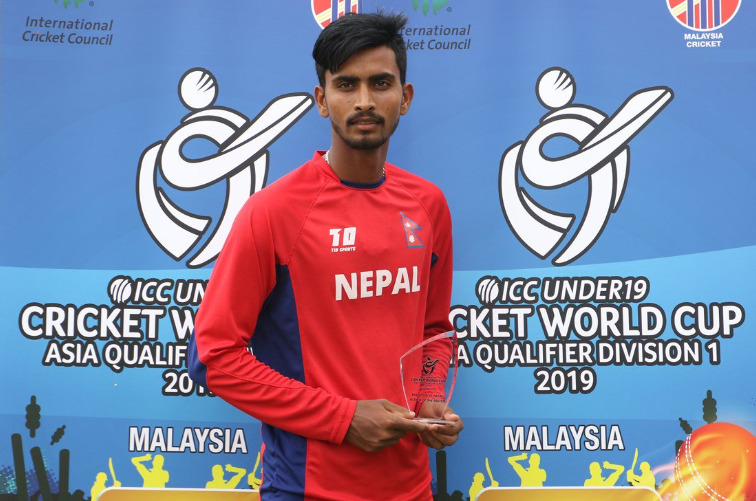 RK Paudel, followed Nepali bowlers Rashid Khan, Surya Tamang and Kushal Malla, was the highest wicket-taker from Nepali bowling side. Then Nepalis began their batting innings in a massive way and did not take much time to finish the set target. Gautam began his batting high on confidence and scored 62 runs in 84 balls. Next in the order, Sarraf also exhibited his outstanding performance by with 53-run score in 61 balls. Aasif Sheikh continued the spirit and scored 33 runs in 20 balls. In partnership with Jora, he drove the team to the winning streak. Nepali batsmen finished their target within 28 overs for the loss of just 2 wickets at 5.71 run rate. Gautam grabbed the ‘Player of the Match’ title! 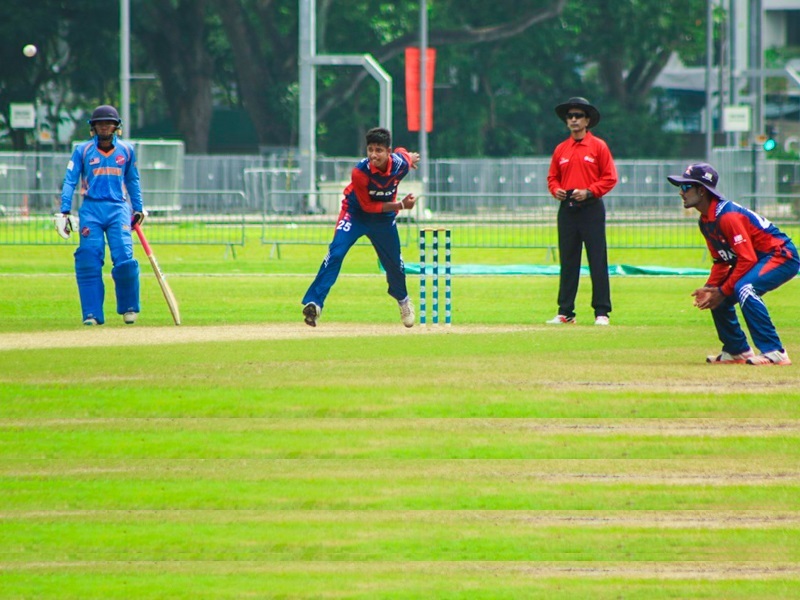 The Match-4 of the ICC U19 tournament saw Nepal and Oman facing each other. Oman won the toss and chose to field first. Nepali team stepped in to bat with Gautam and Sarraf as openers. Openers made a slow start scoring 10 runs and 5 runs, respectively. Then came Basnet, who also scored just 15 runs. Next, in the order, Paudel stood as the game-changer by scoring 75 runs in 81 balls, giving the major boost to the team’s scorecard. Next to Paudel stood Pratis as the second highest scorer with 41 runs in 23 balls, followed by Sharki with 39 runs in 43 balls. 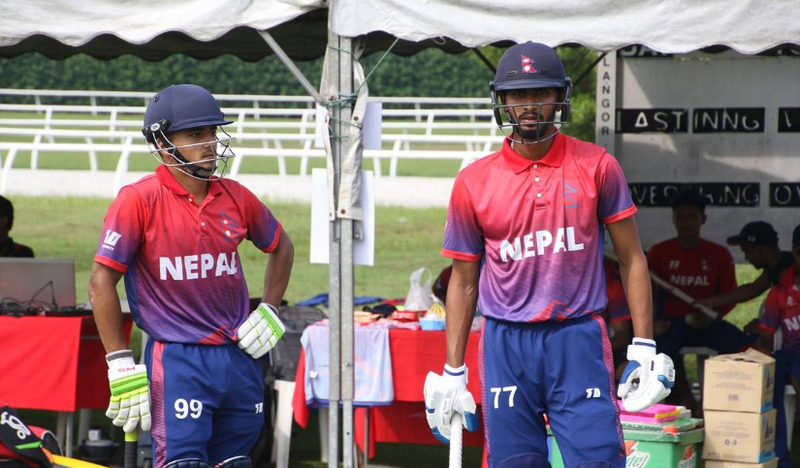 At the end of the innings, the Nepali team scored 229 runs in 43.2 overs, at a 5.28 run rate, for the loss of all wickets. Then stepped in Oman team making a slow start. Despite sincere attempts, the team had a tough time facing Nepali bowlers. Starting with openers, all the team members made only single-digit scores finally falling short of the target. The team was all-out for 79 runs! 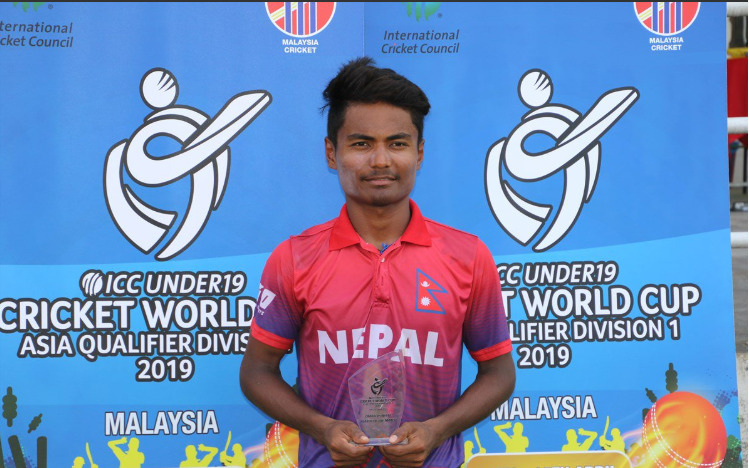 Sarraf stood as the highest wicket taker of the match with 3 wickets, followed by Pratis GC (2) and Surya Tamang (2), among others. Rohit Paudel was announced ‘Player of the Match’! 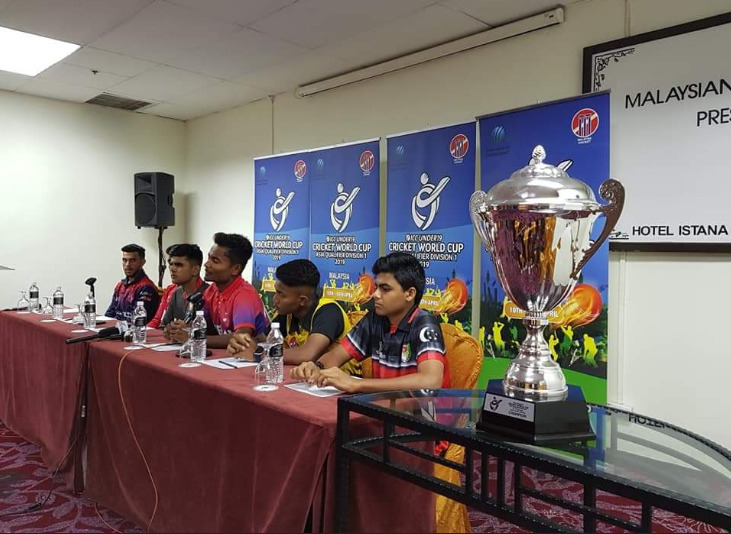 Continuing the winning streak, Nepal won their third match in the ICC U19 Cricket World Cup Qualifier Asia 2019 against Malaysia. 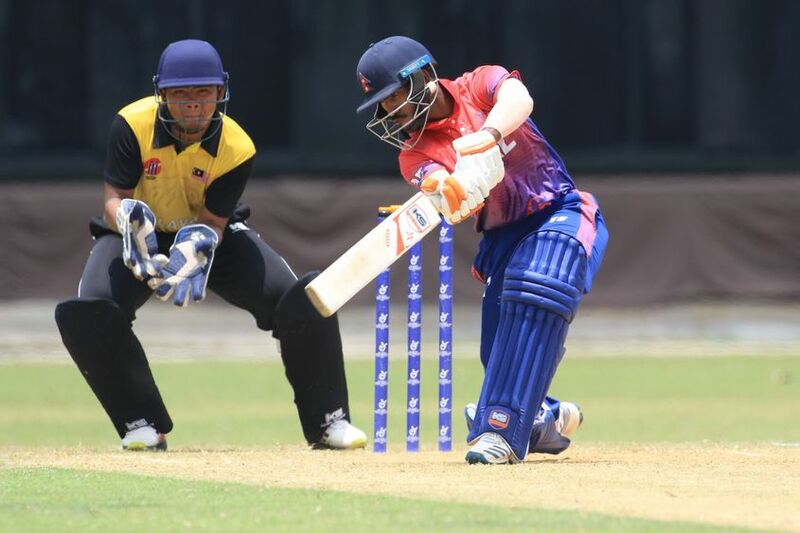 Nepal beat Malaysian U19 team by 8 wickets in just 13 overs! The winning team initially won the toss and elected to field first. Aslam Khan and Wan Amirul opened the match for the Malaysian team but to no avail. Khan was bowled at the very third ball of the match owing to a joint runout from HB Chauhan and KS Airee. On the other hand, Amirul made just 7 runs from 17 deliveries. The game continued on a slump until Iezzat Daniel Fiqry came by and single-handedly gave the team 37 runs off 55 deliveries. Finally, Malaysia wound up the game with a total of 92 runs at 33.5 overs. 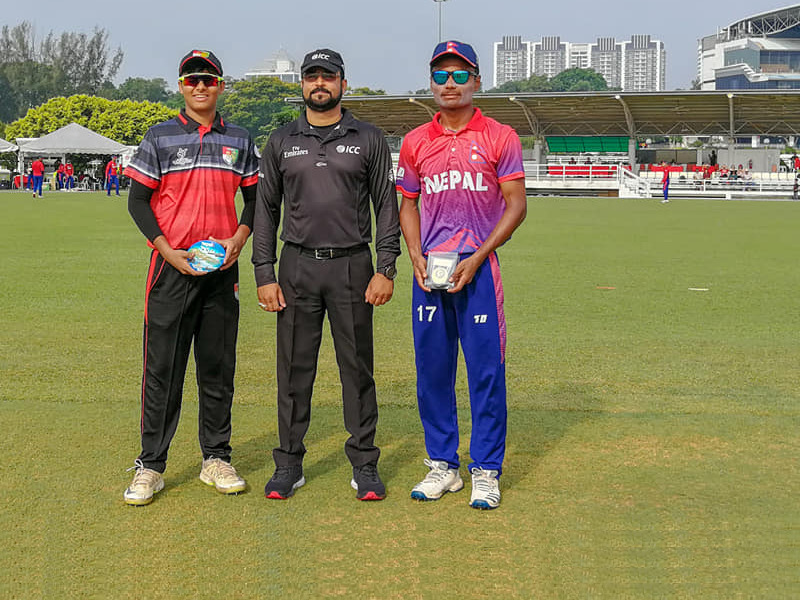 Nepali bowlers Pawan Sarraf and Kushal Malla remained the highest wicket-takers, claiming ‘six’ Malaysian wickets (three each). 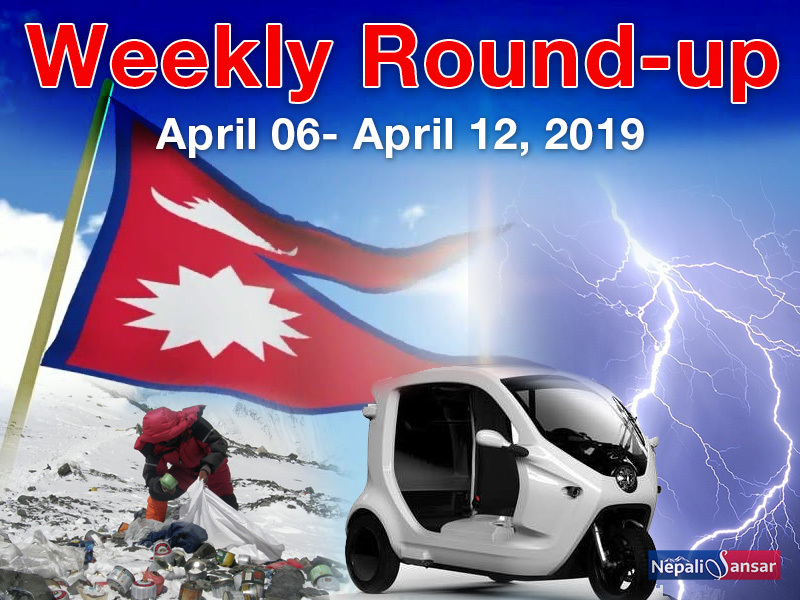 Then came Nepal’s turn. The team began the batting innings with Rit Gautam and Sarraf, who registered a whopping 58 runs to Nepal’s credit. Next in line, Aasif Sheik and Captain Rohit Kumar Paudel registered 26 and 6 runs, respectively. wrapped up its game with 95 runs in 13 out of 50 overs. 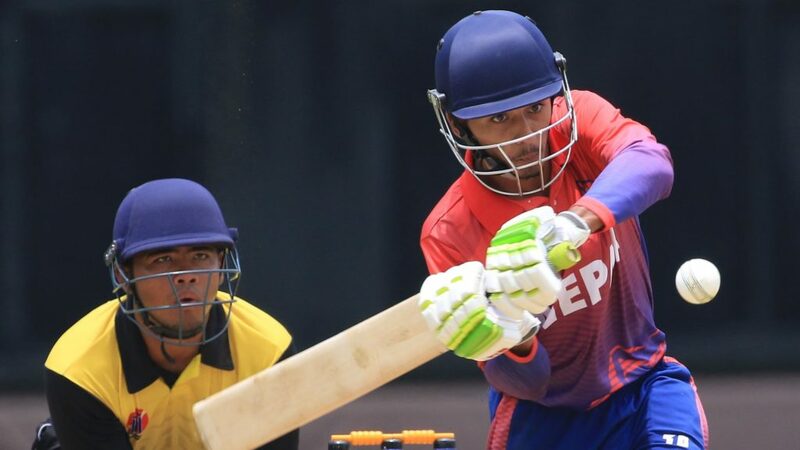 Nepal not only made a strong defense but also displayed a splendid batting performance throughout the match. 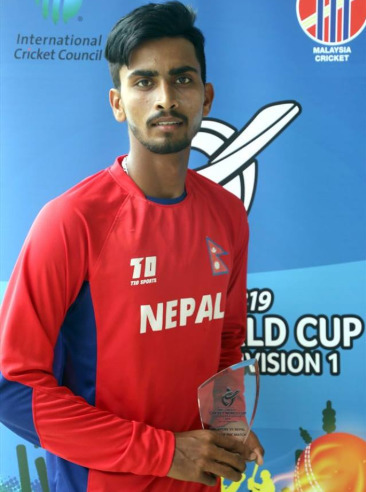 Nepal’s Pawan Sarraf was again named ‘Player of the Match’. Congratulations once again Team Nepal! 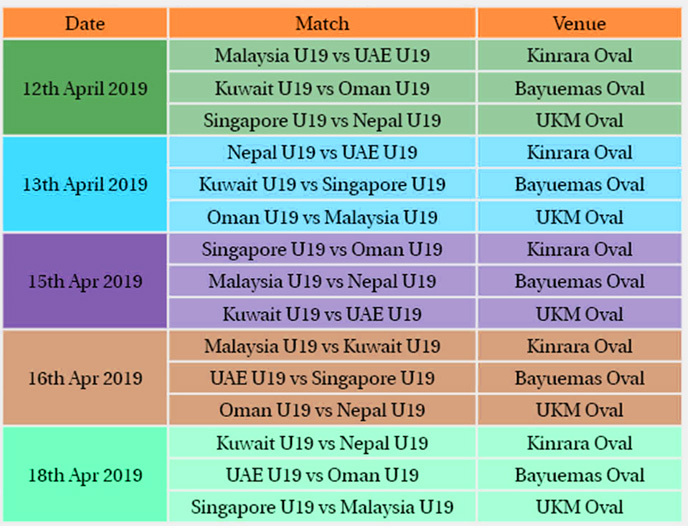 Stay tuned for more interesting updates on the ICC U19 World Cup Qualifier Asia 2019!